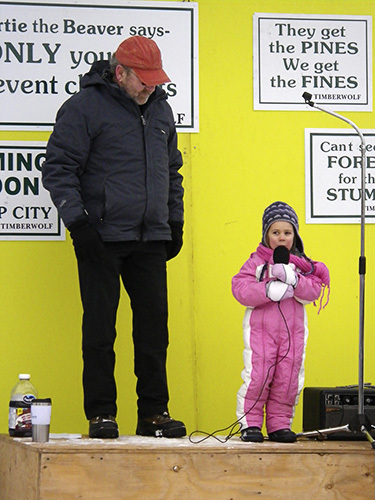 About 150–200 folks from as far away as Canmore, Calgary, and Lethbridge turned out for Sunday’s rally. One after another, speakers got up on the makeshift stage to recite some poetry or read some prose, to sing, or to say a few words. 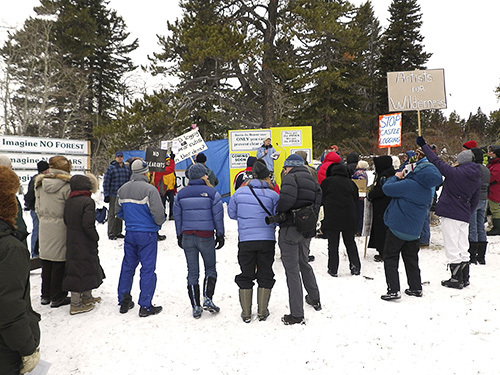 The messages were universally uplifting, but the overall theme was that the government, and particularly the Forest Service, is completely out of touch with the public and that something has to be done to rein them in. This is our forest, and we want a say in how it’s managed. And we want this unwanted and ill-advised logging stopped. I think it’s also fair to say that the general feeling was that the Forest Service has all but lost its social licence to operate. The Service is seen as a dinosaur from another era that needs to either adapt or perish. The event was also a perfect time to visit with friends and neighbours, and to reinforce the fact that we’re all in this together whether in Beaver Mines or farther afield. Here are a few photos from the rally. This entry was posted on Sunday, January 22nd, 2012 at 10:57 pm and is filed under Uncategorized. You can follow any responses to this entry through the RSS 2.0 feed. You can leave a response, or trackback from your own site. 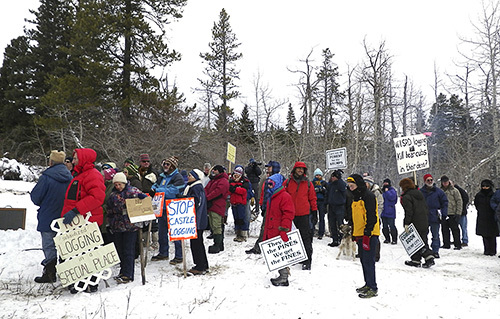 It’s worth noting that since SRD arbitrarily closed the proposed logging area to public access, an additional several thousand skiers have shown their contempt for Premier Redford’s high-handed behaviour. How? By trespassing through the closed zone while driving to the Westcastle Ski Area. Just to emphasize their disdain, they turned around at Westcastle, drove right back and trespassed again! More seriously, Highway 774 to Westcastle is now closed at the proposed logging road under a regulation of the Public Lands Act. According to SRD, every person who enters that zone is guilty of trespass. That includes all Westcastle skiers and many readers here. If SRD considers your vehicle an “improvement,” it is now owned by the Redford government under the terms of the closure. More interestingly, for most of us clothing has to be considered an “improvement”. So boys and girls, Alison Redford now owns your undershorts! Better confess, and turn them in! Please mail the undergarments that you were wearing at the time you trespassed into the closed portion of Highway 774 to: Premier Alison Redford, Room 307, Legislature Building 10800-97 Avenue Edmonton, Alberta T5K 2B7. And if you so wish, demand to be arrested for petty trespass. Several thousand archcriminals defending themselves in court against the dastardly crime of driving on a public highway ought to keep SRD out of trouble for quite some time, I would think. Any update on what’s happening today (Monday, Jan 24)?